We’d love your help. Let us know what’s wrong with this preview of Writing That Works by Kenneth Roman. To ask other readers questions about Writing That Works, please sign up. I bought a copy of Kenneth Roman and Joel Raphaelson’s Writing That Works because advertising legend, David Ogilvy, recommended it to his staff at his ad agency, Ogilvy & Mather, in a memo he issued back in 1982. I write for a living, so I took note. A lot of what Ogilvy suggested made sense. And a lot of what’s covered in Writing That Works makes sense, too. Actually, it made so much sense that I wound up having a really good, constructive conversation with the CEO at work about the direction w I bought a copy of Kenneth Roman and Joel Raphaelson’s Writing That Works because advertising legend, David Ogilvy, recommended it to his staff at his ad agency, Ogilvy & Mather, in a memo he issued back in 1982. Actually, it made so much sense that I wound up having a really good, constructive conversation with the CEO at work about the direction we ought to be heading in when it comes to writing. I would argue that, when it comes right down to it, good writing actually means good editing. OK this goes on my 'recommended reading for students' list. Too often do I get emails that are actually three emails weirdly intertwined and after spending 10 minutes untangling the email I have no idea what I'm supposed to do - is there a question or action for me anywhere? This book is a generic 'how to write' book with a focus on business writing in the form of internal memos. There are tips and helpful advice on writing reports, letters, grant applications, CVs, speeches, and lots on proper e OK this goes on my 'recommended reading for students' list. Too often do I get emails that are actually three emails weirdly intertwined and after spending 10 minutes untangling the email I have no idea what I'm supposed to do - is there a question or action for me anywhere? 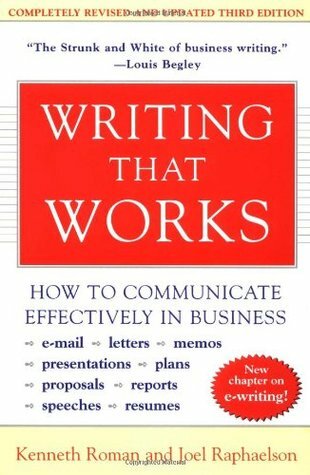 This book is a generic 'how to write' book with a focus on business writing in the form of internal memos. There are tips and helpful advice on writing reports, letters, grant applications, CVs, speeches, and lots on proper etiquette, starting with 'how do I address the recipient?' to CC/BCC behaviours, to 'coping with political correctness' (in a nutshell: you may not like it but 'minorities suffer enough without being labeled with terms they regard as offensive, regardless of what the writer may think of their preferences or their reasons'). I read the 3rd edition from a curious time when e-mails were taking over, yet hand-written memos were still a thing. That's not an issue to the reader as everything written on business memos is equally applicable to business e-mails, lots of cute stuff ('there's ISDN now! So fast!'). Anyway, as I said above, this goes on the recommended reading list pile for students, there's enough knowledge here to remove 80% of my pain with other people's (and my own!) emails. I give it 2 stars because they gave 1 piece of good advice: DON'T MUMBLE. I know it's an old book, I just wish it wasn't promoted as something evergreen. Also, it's recommended as a must read by David Ogilvy, which is fun because it was written by people who worked for David Ogilvy. I ALSO WOULD LIKE TO RECOMMEND THIS GREAT BOOK BY MY COLLEAGUE BUY THIS. If your day job involves communicating to other people (almost certainly it does), give this book a try. It uses several representative examples to come upon its thesis that effective communication is the paramount to business/job success. This book would have done better to focus on one area or two. By attempting to cover email, presentations, resumes, proposals, and a swath of other areas in 180 pages, the book ultimately fails. What's more, I found the material to be pretty basic. I hate to be critical, but presentations require separate texts. This book just covers major areas in a rather perfunctory manner. Some sections were a bit boring (improve your resume for example), but I've enjoyed a lot the one about Presentations & Speeches. Louis Begley recommends this as "The Strunk and White of business writing". Like Strunk & White, most of Writing That Works is painfully outdated, which makes sense - the third edition was published in 2000, almost 20 years ago. You can chuck out about 90% of what they wrote on email and the Internet, to start. Most job transactions happen online, stuff rarely takes "too long" to download, and printing your email to come back to it the morning is a waste of paper. Oh, and good luck telephonin Louis Begley recommends this as "The Strunk and White of business writing". Like Strunk & White, most of Writing That Works is painfully outdated, which makes sense - the third edition was published in 2000, almost 20 years ago. You can chuck out about 90% of what they wrote on email and the Internet, to start. Most job transactions happen online, stuff rarely takes "too long" to download, and printing your email to come back to it the morning is a waste of paper. Oh, and good luck telephoning a company to see if they want to interview you. If they do have a landline, there probably won't be a recruiter at the end of it. There's only one piece of truly timeless advice - don't hit Reply to All on an email thread unless you really have to. They should frame that in every office that uses email. Chapters on speeches and proposals are OK. I liked the use of real-life examples, even though some things were common sense. Don't follow their resume advice, though. Sticking to bland facts and empty, impersonal phrases won't fly in the age of human-voiced resumes. And for the love of God, do use bullet points. They won't 'confuse scanners', and the human recruiter reading your CV will appreciate it. Many of the approaches in this book could be regarded as good advice on clear writing; many of the specifics are outdated. However, that doesn't diminish the value of this book because they authors explicitly argue that readers should always be adapting to the audience and that past usage may no longer be appropriate. The chapter on political correctness was a particularly good example in this respect, because it encourages writers to appreciate the views of the audience, especially minority gro Many of the approaches in this book could be regarded as good advice on clear writing; many of the specifics are outdated. However, that doesn't diminish the value of this book because they authors explicitly argue that readers should always be adapting to the audience and that past usage may no longer be appropriate. The chapter on political correctness was a particularly good example in this respect, because it encourages writers to appreciate the views of the audience, especially minority groups, and then provides a list of terms which it would be "loony" to believe offensive — and many of the terms on that list would no longer be good choices for business communications. This book has good tips. It provides guidelines and good suggestions for how to write something that is professional, understandable, and, hopefully, effective. It is dated though. It was written in 2000 and you can tell. E-mail is discussed, but there is significance placed on other forms of communicating not used often anymore. Other than that limitation, it is a useful book and worth the quick read by anyone that writes professionally. First of all, it's an outdated book. The authors have revised it but still, it doesn't talk about the world with millennials. I wish the book had more language and stile discussion instead of explaining to write a report. On the other side, I believe it to be a good book for a start. It brings good points about speech, resume, and revisions. While some of the examples might be dated, most of the advice in this book is timeless and commonsense. In 13 concise chapters, the authors recommend the most effective practices for getting your writing read, understood, and acted upon. I will be using this as a handy desk reference for years to come. Don't let the rating fool you: this is a fantastic book. Much of the material, however, is familiar to me and the book often read like a series of lists. One thing I especially liked is how they analyzed the structure of effective letters as a series of actions. Highly recommended for better writing. A lot of the information in this book is old hat for any seasoned business writers. If you are new to the game, it's a good primer. Some of the information in here is dated, but their advice on writing is spot-on and helpful. Great information about resume writing as well. don't mumble. that pretty much summarise the whole idea. rest of the parts you can skip if you're reading it in 2017 like me. Definitely worth a read. Taught me a thing or two. Good light read. Feels quite dated though. Most of the learnings can be synthesized and presented in a short column instead of a book. Improve your writing, make it easier and give yourself a confidence boost. That is what the back of Writing That Works by Kenneth Roman and Joep Raphaelson promises – and they deliver. In less than 200 pages they take the reader on a journey along the basics of effective writing. First they tackle the most common mistakes we all make, like mumbling, writing too difficult, or non-specific. After that the book tackles specific areas such as writing for audiences, writing report that make things ha Improve your writing, make it easier and give yourself a confidence boost. That is what the back of Writing That Works by Kenneth Roman and Joep Raphaelson promises – and they deliver. In less than 200 pages they take the reader on a journey along the basics of effective writing. First they tackle the most common mistakes we all make, like mumbling, writing too difficult, or non-specific. After that the book tackles specific areas such as writing for audiences, writing report that make things happen, and how to write a resume. If you want to know how to communicate effectively (in business), than this book may be something for you! I've always been of fan of the classic guide to writing, The Elements of Style, otherwise known by its informal, eponymous moniker, Strunk & White. It's short, clear, and makes a great reference for all writers. Writing That Works is the modern business equivalent of The Elements of Style. Although Writing That Works is dated in some aspects, the original edition came out when the Internet was a novelty, the lessons it conveys are solid. The chapter entitled Don't Mumble is worth the price o I've always been of fan of the classic guide to writing, The Elements of Style, otherwise known by its informal, eponymous moniker, Strunk & White. Writing That Works is the modern business equivalent of The Elements of Style. Although Writing That Works is dated in some aspects, the original edition came out when the Internet was a novelty, the lessons it conveys are solid. The chapter entitled Don't Mumble is worth the price of the book. In essence, this book is a short lesson on business writing. Writing that is economical, persuasive, and direct. Unfortunately, college does a poor job in developing strong communicators. Many employers have lamented the lack of strong writing skills of the recent graduating classes. I don't believe that recent graduates lack the ability, only that academia tends to be a poor training ground for concise and clear writing. Academia's focus is on helping students build effective arguments, which tend to create writers that ramble on. Business writing is more to the point, less flowery, and more direct. And with email communication dominating companies both large and small, getting to the point quickly and clearly is more important than ever. Like Strunk and White, this book makes an excellent reference. Putting its lesson into practice will help you unlearn the poor habits from years academic writing. Your writing will be clear and powerful. It will stand out in the lines of cluttered jargon that infects most business correspondence. Writing That Works is an updated book on business writing that includes sections on email, presentation decks (bullet pointed lists often in powerpoint), and a reminder that computers are only as good as what you put into them. The writers describe when it is appropriate to use paper memos and letters to add a personal touch or appear official. They also talk about how to give presentations to sell your product or idea in person. The book covers written documents, presentations, and the internet. The chapters are short, clear, and present clear business objectives; getting a job with a resume, getting money for your ideas, saving time by managing email properly, and selling yourself in writing. Kenneth Roman and Joel Raphaelson open the book with a statement that the point of business writing is to get things done, not just to be clear. There is a reminder to edit your work, be understandable, and write for a specific objective. Kenneth Roman and Joel Raphaelson do this with ease. They make excellent use of bullet pointed lists, indented italicized text, and bold headings which catch your attention. Muito bom. Mesmo com 17 anos de idade, tem dicas superatuais sobre escrita e algumas que podem ser muito úteis no ambiente corporativo mesmo que as regras tenham mudado. Recomendo fortemente. E se quiser, tenho as citações arquivadas em um fichamento. Well, when David Ogilvy recommends a book about writing, you simply download it on your Kindle - no questions asked but with expectations raised. And that's the folly with recommendations from big folks - you run into the risk of over-expecting... like an Indian parent. Undoubtedly, it's a good book, but it's a book that has failed to stand the test of time. The first four chapters are true masterpieces. Their simple motive is impressive - Business writing is primarily about communication. Style Well, when David Ogilvy recommends a book about writing, you simply download it on your Kindle - no questions asked but with expectations raised. And that's the folly with recommendations from big folks - you run into the risk of over-expecting... like an Indian parent. Undoubtedly, it's a good book, but it's a book that has failed to stand the test of time. The first four chapters are true masterpieces. Their simple motive is impressive - Business writing is primarily about communication. Style is merely some garnish on top. Now that's brutal for quite a lot of authors who love going verbose (James Joyce's grinning in his grave surely). But then it's their style while writing fiction. However, a company report is not fiction - unless it's an investor pitch. Communication is absolution, artsy-writing is castration. 1. You are afraid of writing and want to get started with the simple stuff. Solid and helpful. I came across it when I was looking at an article by David Ogilvy on the Communication Arts website. Ogilivy was the founder of the ad agency, Ogilvy and Mather, and he is known for using writing as an advertising tool. He made copywriting significant and cool. Ogilvy believed and proved that if the writing is good, people will read it. In the article, he advises to read this book three times. If you want to write effectively, this book will show you how. There's also a sectio Solid and helpful. I came across it when I was looking at an article by David Ogilvy on the Communication Arts website. Ogilivy was the founder of the ad agency, Ogilvy and Mather, and he is known for using writing as an advertising tool. He made copywriting significant and cool. Ogilvy believed and proved that if the writing is good, people will read it. In the article, he advises to read this book three times. The book's essential premise is: be clear when writing. Use clear and active words. Don't mumble in writing. But writing like this is also simple. People might think of you as a simpleton. Tthat means a stupid person. Seriously though, the main drawback of this book that it neglects the impact of culture on communication and writing: the guidelines are written as to work in the American / Western European context. I can tell some of the things this book suggests to avoid are exactly the kind of t The book's essential premise is: be clear when writing. Use clear and active words. Don't mumble in writing. But writing like this is also simple. People might think of you as a simpleton. Tthat means a stupid person. There's a lot of good writing tips and advice between the covers of this book. Actually, more precisely, there's a lot of good COMMUNICATION tips between its covers. I've been actively applying some of them to my email communications over the past few days, and I've noticed a difference in the level of response they've generated and a lesser degree of "back-and-forth" trying to get a message across. Looking forward to trying to apply more of the advice to my other forms of writing and presentatio There's a lot of good writing tips and advice between the covers of this book. Actually, more precisely, there's a lot of good COMMUNICATION tips between its covers. I've been actively applying some of them to my email communications over the past few days, and I've noticed a difference in the level of response they've generated and a lesser degree of "back-and-forth" trying to get a message across.